FACT CHECK: Did Obama Have Journalist Brenda Lee Forcibly Removed from Air Force One? Did Obama Have Journalist Brenda Lee Forcibly Removed from Air Force One? Barack Obama has possibly set a record for being the target of the most false political equivalencies. Misinformation is a real threat.Snopes.com needs your help. The Daily Debunker brings you the top stories on Snopes.com. Brenda Lee was forcibly removed from Air Force One by order of President Obama due to her pro-life views. Remember this during Obama’s criminal administration? This is Brenda Lee, a journalist from the Georgia Informer being physically removed from Air Force One in 2009 by Obama’s order. She didn’t grab anyone like Jim Acosta did. Brenda was removed for being pro-life. 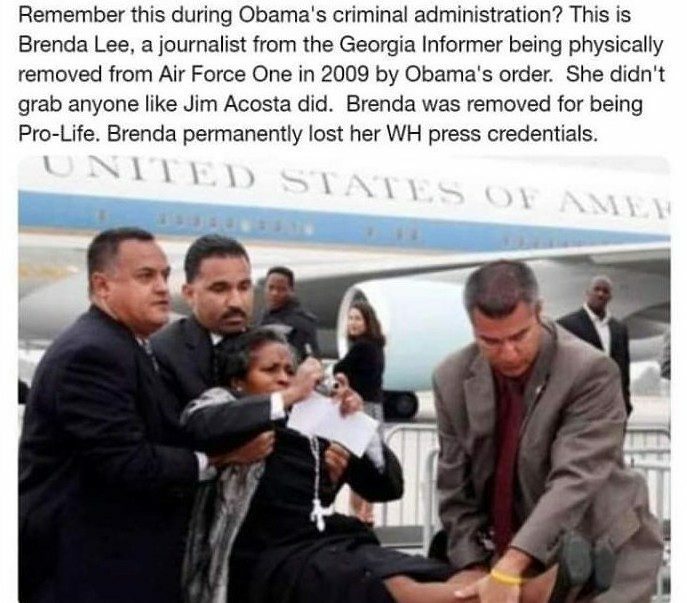 Brenda permanently lost her WH press credentials. Brenda Lee was not on board Air Force One (as such, she could not have been “removed” from the presidential plane). Lee was not removed from the press area at LAX by “Obama’s order.” President Obama wasn’t even at the airport at the time of the incident. Lee didn’t grab someone “like Jim Acosta did,” as video shows that Acosta didn’t grab anyone. Lee was not removed for being “pro-life”; she was removed for refusing to heed instructions from security personnel. We found no reports documenting that Lee “permanently lost her White House press credentials.” We also could not confirm that Lee had ever received press credentials from the White House to begin with. A reporter for a small newspaper was forcibly removed from a press area near Air Force One shortly before President Barack Obama arrived at Los Angeles International Airport to depart California. Airport security officers carried the woman away by the feet and arms as she protested her removal. She later identified herself as Brenda Lee, a writer for the Georgia Informer in Macon and said she has White House press credentials. The newspaper’s Web site says it is a monthly publication, and a Brenda Lee column is posted on it. At LAX, Lee asked a Secret Service agent to take her letter to President Obama after learning that the president wasn’t scheduled to take any questions at the appearance. The staffer came and asked to see the letter. “He said his name was Worly but I doubt that was his real name,” Lee said. After “Worly” gave Lee the letter back, another staffer asked to see it, Lee said. Lee said that she’d rather give it to Obama herself when he walked by. When Lee refused to surrender the letter, the man had security remove her, Lee said. Lee said she thinks she was being discriminated against for being a priestess, and that a priest wouldn’t have received the same treatment. She said she was discriminated against because her stand for traditional marriage offended the staffer. Outside the terminal, a police officer chided Lee for making a scene, she said. Lee was questioned after the incident by police and then released. This is at least the second time that internet trolls have used out-of-context images to claim that President Obama mistreated the media. A video of Obama’s calling for a heckling protester to be removed from a White House event was shared as if it depicted him having a reporter thrown out for asking an unfair question at a press conference. Orange County Register. 28 May 2009. Did an Ohio State Rep. Propose Exempting African-American Women From Abortion Restrictions? 19 April 2019 State Rep. Janine Boyd garnered national attention for an amendment she proposed to the state's controversial "fetal heartbeat" law. Were Razor Blades Found in Gas-Pump Handles in Michigan? 19 April 2019 Hoaxes and reality sometimes overlap. Did Actor Keanu Reeves Save Dozens of Cats from Euthanasia? 19 April 2019 He may well be one of the most beloved celebrities on the internet. Did President Trump Say ‘This is the End of My Presidency. I’m F*cked’ After Mueller’s Appointment? 19 April 2019 According to the Mueller Report, U.S. President Donald Trump was less than enthused about the appointment of the special counsel. Is the Trump Administration Seeking to Monitor Social Media Accounts of Disability Recipients? 19 April 2019 The U.S. Social Security Administration proposed stepped-up evaluation of social media posts when investigating peoples' disability claims. Did Nostradamus Predict the ‘Descent of Man’ After the Notre Dame Fire? 16 April 2019 Time after time, a major news event produces a big mess to mop up on social media. 11 April 2019 President Trump’s overall unfavorable rating has remained steady at 55 percent since he announced his candidacy in 2015. 4 April 2019 The late hip-hop musician and community activist was making a documentary about holistic healer Dr. Sebi. 1 April 2019 The 21-year-old from Huntersville, North Carolina, was found hanged in his own truck in Fort Wayne, Indiana, on 14 March. © 1995 - 2019 by Snopes Media Group Inc. This material may not be reproduced without permission. Your search did not yield any results. Your search terms may need to be revised, or we have not written an article on that topic. 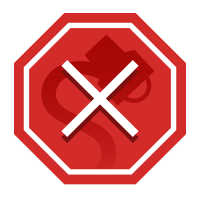 One of the best tips for locating articles on our site is to avoid the use of searches that are too lengthy or specific. Therefore, the optimal search strategy is to avoid pasting specific phrases from items (such as subject lines and opening sentences) into our search engine and instead focus on selecting a few distinctive words or names to use as search terms. If you still don't find the item you're looking for, please use our Submission Form to send it to us. We can't write about it if we don't know about it!